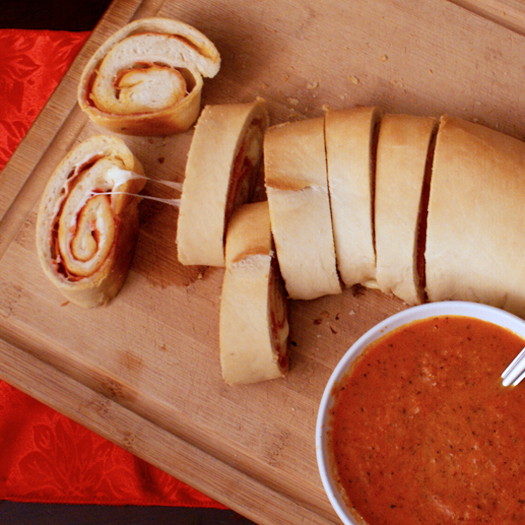 If there's one food I think of when I think of holiday cookin', it's pepperoni bread. Seem strange to you? Not to me! When I was growing up, my Mom always made snackers for our family to feast on for our Christmas tree trimming party and on New Year's Eve. I find it funny how my memories are so focused on the food we had as much as the hanging of the tinsel and the charades on New Year's. Guess I've always been a foodie at heart! I've since carried on the tradition with my family and we make various finger foods like chips and dips and wings, but pepperoni bread is always the star of the snackers show! You can buy pre-made pizza dough or frozen bread dough, which is what my Mom always used, but I prefer to make my own dough in the bread machine. Whichever route you decide to go, I'm sure you'll love this fabulously simple bread! Place the first five ingredients in your bread machine in the order listed. Set the machine to dough and let it go to work! On a lightly floured surface, roll the dough out in to a large rectangle about ¼ inch thick and 12 x 18 inches. Don't worry if it's not perfectly square. Close is good. Lay out the cheese and pepperoni over the dough. Cheese first, then the pepperoni. Leave at least a half inch of dough showing around the edges. 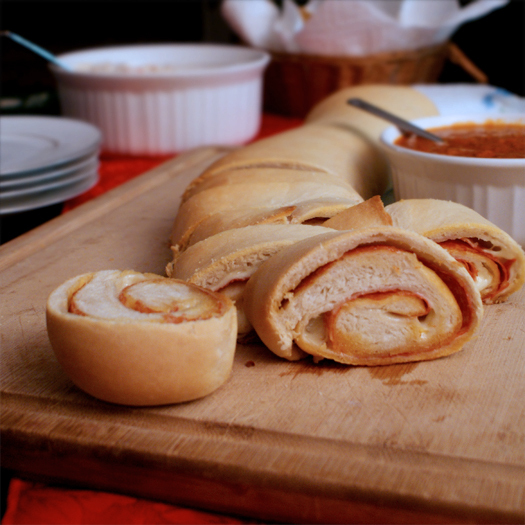 Roll into a long log (jelly roll style) beginning with the long edge making sure to fold in the sides as you go. Pinch the seam closed. Place on a parchment lined cookie sheet with the seam side down. Bake in the preheated oven for 25-30 minutes. Note: The seam will most likely bust somewhere. Or the edge will ooze out cheese. If it does (and it will), don't sweat it! There will still be lots of cheesy yummy pepperoni goodness inside. Remove from the oven and brush with melted butter. Slice with a serrated knife into 1 inch slices and serve with a side of sauce.